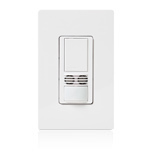 Combined benefits of 0-10V dimming and PIR occupancy/vacancy sensing to provide optimized dimming performance and superior sensing with Lutron’s XCT Sensing Technology. No neutral required, comes in occupancy/vacancy mode or vacancy only. 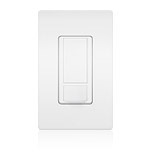 Automatically switches lights on and off to provide convenience and energy savings. 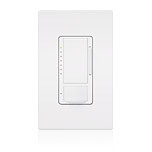 This product controls 6A at either 120 or 277V. Provides flexible sensing control from a single switch to two independent circuits (6A per circuit). 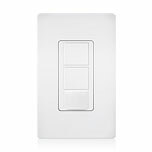 It's ideal for bi-level switching applications such as independently controlled flourescents in a classroom or restroom fan/lights. 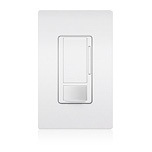 Automatically switches lights on and off to provide convenience and energy savings. Available in 2A, 5A, and 6A (dual-voltage) models. Provides flexible sensing control from a single switch to two independent circuits (6A per circuit). It's ideal for bi-level switching applications such as independently controlled fluorescents in a classroom or restroom fan/lights. 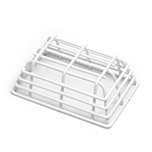 Wire cage guards are heavy-duty, coated, 9-gauge wire guards that can be used to minimize or reduce sensor damage. Mounting clips are included.